Yesterday at GDC Unity3d 5.0 got released. As a long term, long time user of it this is an interesting time. Many of the fancier features around how graphic designers can make things look nice are not that high on my list of things I needed, however its all very welcome. I had tried the beta of 5.0, but I was mostly on 4.6 as this is the version that every project I have worked in and also introduced the shiny new user interface pieces of code. Before wrecking any projects with imports and checking all the old stuff worked I thought I would just throw together some things with the new basic prefabs and assets. There is a nice ready rigged car and also a couple of planes in the kit bag now. I created a terrain, imported some SpeedTree trees from the asset store. Asked it to mass place the trees for me. I added a wind zone to make the trees blow around. The camera I moved to attach to the car. Just for fun I dropped a few physics objects in it. Spheres and blocks. So now there is a car world to raz around in knocking things over. All this took about 15 minutes. It is here (if you have a unity plugin) Make sue you click to give the world focus then the arrows work to drive around. I then built an HTML5 version. This is slightly more clunky as it is early days for this rather than the player. It is also 200mb as opposed to the 30mb of the player version. So rather than sit and look at a blank screen the version is here on dropbox. That makes sense as of course the HTML5 version has to bring its own player type scripts. 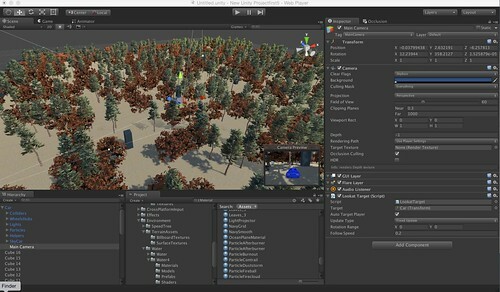 Even with Unreal engine now out there for free Unity3d seems much more accessible as a techy. I am looking forward to exploring some of the new stuff like the mixing desk for audioscapes. I also seem to have Playmaker free to download as part of “level 11” on the shop. That lets you create more flow chart based descriptions of camera pans etc. The extra elements in the animation system also look intriguing. As Unity3d covers the entire world of work when it comes to games it is hard to be great at everything, but it does let anyone, techie, designer, musician, animator etc all have a look at one another worlds. I think the next project, in 5.0 will be the most interesting yet.